Who is awarded tenure in the competitive environment of contemporary colleges and universities is one of the more hotly contested issues in academe today. The pressure is on for tenure-track faculty to make their case to a university or college to make them a permanent hire. Decisions around tenure and continuing appointment at colleges and universities across the country are often opaque, but the process has been particularly mystifying for Aimee Bahng, an assistant professor of English at Dartmouth College. 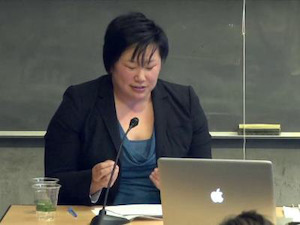 In early May, Bahng was denied tenure despite the unanimous support of her colleagues in the English Department tenure committee. Bahng has taught at Dartmouth since the fall of 2009. Her curriculum vitae lists degrees from an array of prestigious institutions: Princeton, Middlebury, and the University of California, San Diego. She has two books forthcoming with Duke University press, one to be published in 2017, and a long list of publications and conference talks under her belt. The Dartmouth community reacted with vocal dismay to the news of Bahng’s tenure denial. Adding fuel to the fire, Dartmouth is currently in the midst of a multi-year push to diversify its faculty ranks and to create a more inclusive atmosphere on campus. In the week that Bahng was denied tenure, the college released four new institutional reports on the need to diversify the professoriate. In 2014, the institution made a commitment to build up the number of tenure-track minority to 25 percent. According to the most recent institutional report on faculty diversity, published in January, 16 percent of faculty are minorities. A deeper dive into the numbers of diverse faculty, based on data from the Office of Institutional Research, shows that relatively few minorities are full faculty. In the School of Arts and Sciences, for instance, 18 out of 209 full professors are underrepresented minorities. In the absence of greater diversity among the faculty, those faculty who do represent minority groups find themselves being asked to take on a large role in Dartmouth’s current process of examination of its diversity and inclusion, Bahng told Diverse. At times, the effect is such that she and other colleagues feel like “unpaid diversity consultants,” she said. In a phone interview with Diverse on Monday, Denise Anthony, Dartmouth vice provost for academic affairs, acknowledged that there is no single, easy fix to the problem of recruiting and retaining a more diverse faculty. Entirely separate from issues surrounding Dartmouth’s commitment to creating a more diverse faculty, said Richard Wright, is the matter of Bahng’s qualifications for full tenure. Wright is a professor of geography at the college. Tenure at Dartmouth is decided based on a vote from a departmental committee and then put before the CAP (Committee Advisory to the President), which made the final call. Bahng still has the option to appeal the decision. Wright, who has been at Dartmouth since 1985, said that, to his knowledge, tenure appeals are “not often” successful. During her time at Dartmouth, Bahng has shown herself to be innovative in her teaching. One course that brought Bahng and the college alike widespread media attention is a Black Lives Matter course that she helped create two years ago. She created the course in the aftermath of the St. Louis grand jury decision in 2014 to not indict Darren Wilson for the shooting of Michael Brown. Bahng is teaching the class this spring for the second year with colleague Dr. Reena N. Goldthree, assistant professor of African American studies. In addition, Bahng specializes in Asian American studies, which have particular resonance for Dartmouth. Currently, the college offers courses in Asian American studies but does not offer a minor or major in the field, despite student and alumni interest.